Another fascinating story in the never-ending saga of stolen artworks... I predict that when the Cuban dictatorship finally implodes, a lot of French millionaires will have to return to Cuba its arts legacy, illegally stolen from their owners in the early 1960s, and sold for cold-cash, to (mostly) French adorers of the Castro-brothers' regime. In June of 2012, the Henie Onstad Kunstsenter (HOK) was contacted by the heirs of Paul Rosenberg. 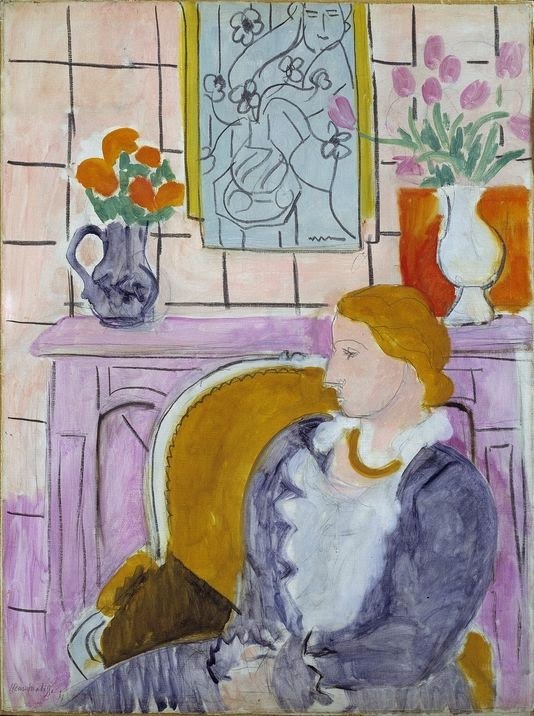 The heirs presented documentation demonstrating that Henri Matisse’s painting Profil bleu devant la cheminée (Woman in Blue in Front of a Fireplace) dated 1937, was unlawfully dispossessed as a result of Nazi persecution from the famed French gallery owner and collector. Although Mr Rosenberg was able to flee to New York with his family in 1940, artworks belonging to him were confiscated by the special Nazi looting agency known as the Einsatzstab Reichsleiter Rosenberg (ERR). This painting was one of 162 works looted on September 5, 1941, and was therefore subject to an active claim of restitution by the Rosenberg heirs. In 1942, the painting was used in trade by agents for Nazi Reichsmarschall Hermann Goering, and subsequently acquired by Gustav Rochlitz, an art dealer active in Paris who was convicted in 1947 before a French Tribunal for trading illicitly acquired property during the Nazi occupation. The painting was acquired by Niels Onstad from Galerie Henri Bénézit in Paris around 1950 and it has been a part of HOK’s collection since 1961. From 1946-1960, Paul Rosenberg and his heirs made numerous declarations in search of the painting to no avail. None of these reached Mr Onstad nor HOK. Prior to including the painting in the HOK Collection in 1960, Niels Onstad requested detailed provenance information, but did not discover the Rosenberg claim. Since then, the "provenance Paul Rosenberg Collection" has followed the painting in catalogues and numerous exhibitions all over the world. The knowledge of the whereabouts of the painting did not reach the heirs of Paul Rosenberg. Although it is HOK’s unwavering position that both Niels Onstad, and subsequently HOK, acquired the painting in good faith, HOK has chosen to adhere to international conventions and return the painting to Rosenberg’s heirs, a decision for which the heirs express their deep appreciation. “Henie Onstad Kunstsenter’s extensive investigation of the case has led to the decision that the return is justified, and HOK’s board has decided to return the painting without further conditions” says Halvor Stenstadvold, chairman of the board of HOK. “This painting has been in our collection since HOK was founded; it is a key work, important for both HOK and its patrons. The comprehensive investigations have been exhaustive and HOK has taken the time necessary to examine all available facts in the case. The case may serve as a precedent for similar cases in the future. Our knowledge of archives and resources regarding provenance research will be made available to the public through a variety of exhibitions, seminars and publications during 2015” says Tone Hansen, HOK’s director. Research was conducted by the HOK and the Rosenberg heirs in French and American archives, and HOK has collaborated with a number of museums, institutions and experts in France. The investigations confirmed that the painting was stolen from Paul Rosenberg as a result of Nazi persecution. The case is the first of its kind in Norway, and while all such cases must be treated individually, HOK’s resolution will most likely impact other Norwegian institutions. HOK’s evaluations have thus been methodical, exhaustive, and under the guidance of the Ministry of Culture. It has been a demanding process for a single institution to undertake, and as a result HOK has called for the formation of a national committee. This committee would be charged with examining public collections and will be modeled after similar programs undertaken in the Netherlands, Germany and France. Norway was one of the signatories of the Washington Conference Principles on Nazi- Confiscated Art in 1998 along with 43 other countries. HOK is a member of the International Council of Museums (ICOM) whose Code of Ethics were considered in conjunction with the Washington Conference Principles. This restitution signifies the resolution of one claim for the Rosenberg heirs, but as for many families affected by Nazi-era looting, the challenging search continues for numerous spoliated works yet to be recovered.